The ledge, where I placed my candle, had a few mildewed books piled up in one corner; and it was covered with writing scratched on the paint. 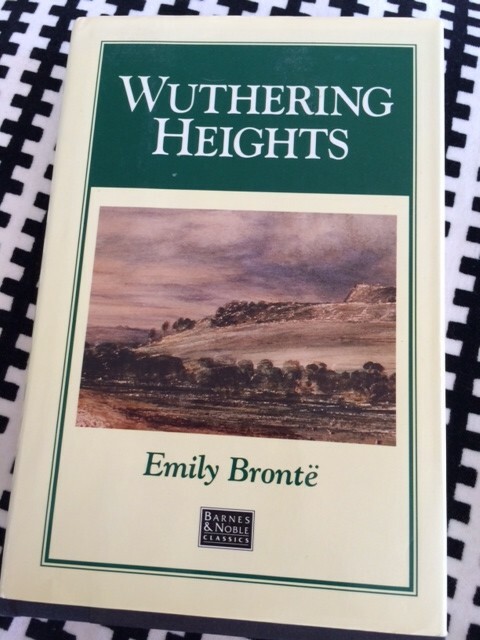 This writing, however, was nothing but a name repeated in all kinds of characters, large and small –Catherine Earnshaw, here and there warred to Catherine Heathcliff, and then again to Catherine Linton. When I was 17 my mother wanted to watch the old black and white movie Wuthering Heights with Lawrence Olivier. She wanted to rent it and watch it during the holidays. I BEGGED her to wait while I read the book. Starting on December 25th, I knocked it out in a couple days and fell in love with the gloom that is this story. My mom and I then rented the movie (along with several others) and we turned the lights off and fell into the sea that is Olivier’s acting. See…my mother and I shared a love of old movies. And being a family that didn’t celebrate Christmas, binge movie watching was one of the joys of the holiday school break for me. It was also something she and I could do…a way to communicate over a shared love…that wasn’t as complicated as the rest of our relationship. Twenty years have passed (almost 21). 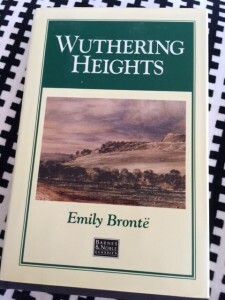 And every year in each of those 20 years between December 26th and January 1st, I dive headlong into the dark world or words of the manor called Wuthering Heights. Heathcliff is miserable, brooding, and dark but OH how he loves Catherine. He is the orphan who follows his misery instead of a trite or expected story of redemption and happiness. He is haunted. And the narrator tells the story of the haunted man and the beautiful, buck fickle lady in such a way that I’m just enthralled enough not to be miserable. Oh those beautiful rolling, rainy hills. Mud and dark and gloom to match the heart of the man.